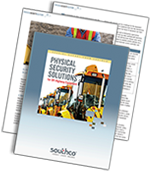 Get the Special Report that shows you how to incorporate an enhanced level of security into your Off-Highway Equipment designs with electronic locks, latches and access solutions designed for rugged environments. Learn how electronic access solutions can be used to secure vehicles and equipment on the jobsite. Protect against unauthorized access and theft by downloading Southco’s Special Report now. © Southco, Inc. All Rights Reserved.